CLOUD NATIVE - The Why? Early technology adapters like FANG (Facebook, Amazon, Netflix & Google) have some common themes when it comes to shipping software. They have invested heavily in building capabilities that enable them to release new features regularly (weekly, daily or in some cases even hourly). They have achieved this rapid release cadence while supporting safe and reliable operation of their applications; in turn allowing them to respond more effectively to their customers’ needs. They have achieved this level of agility by moving beyond ad-hoc automation and by adopting cloud native practices that deliver these predictable capabilities. DevOps,Continuous Delivery, micro services & containers form the 4 main tenets of Cloud Native patterns. All of them have the same overarching goal of making application development and operations team more efficient through automation. At this point though, these techniques have only been successfully proven at the aforementioned software driven companies. Smaller, more agile companies are also realising the value here. However, as per Joe Beda(creator of Kubernetes & CTO at Heptio) there are very few examples of this philosophy being applied outside these technology centric companies. Any team/company shipping products should seriously consider adopting Cloud Native practices if they want to ship software faster while reducing risk and in turn delighting their customers. CLOUD NATIVE - The What? Cloud Native practices comprise of 4 main tenets. DevOps is the collaboration between software developers and IT operations with the goal of automating the process of software delivery & infrastructure changes. Continuous Delivery enables applications to released quickly, reliably & frequently, with less risk. Micro-services is an architectural approach to building an application as a collection of small independent services that run on their own and communicate over HTTP APIs. Containers provide light-weight virtualisation by dynamically dividing a single server into one or more isolated containers. Containers offer both effiiciency & speed compared to standard Virual Machines (VMs). Containers provide the ability to manage and migrate the application dependencies along with the application. while abstracting away the OS and the underlying cloud platform in many cases. Self managing infrastructure through automation: The Cloud Native practice goes beyond ad-hoc automation built on top of virtualisation platforms, instead it focuses on orchestration, management and automation of the entire infrastructure right upto the application tier. Reliable infrastructure & application: Cloud Native practice ensures that it much easier to handle churn, replace failed components and even easier to recover from unexpected events & failures. Security: Enable developers to build security into applications from the start rather than an afterthought. More efficient use of resources: Containers are lighter in weight that full systems. Deploying applications in containers lead to increased resource utilisation. Software teams have grown in size and the amount of applications and tools that a company needs to be build has grown 10x over last few years. Microservices break large complex applications into smaller pieces so that they can be developed, tested and managed independently. This enables a single microservice to be updated or rolled-back without affecting other parts of the application. Also nowadays software teams are distributed and microservices enables each team to own a small piece with service contracts acting as the communication layer. CLOUD NATIVE - The How? Now, lets look at the various building blocks of the cloud native stack that help achieve the above described goals. Here, we have grouped tools & solutions as per the problem they solve. We start with the infrastructure layer at the bottom, then the tools used to provision the infrastructure, following which we have the container runtime environment; above that we have tools to manage clusters of container environments and then at the very top we have the tools, frameworks to develop the applications. Infrastructure: At the very bottom, we have the infrastructure layer which provides the compute, storage, network & operating system usually provided by the Cloud (AWS, GCP, Azure, Openstack, VMware). 2. Provisioning: The provisioning layer consists of automation tools that help in provisioning the infrastructure, managing images and deploying the application. Chef, Puppet & Ansible are the DevOps tools that give the ability to manage their configuration & environments. Spinnaker, Terraform, Cloudformation provide workflows to provision the infrastructure. Twistlock, Clair provide the ability to harden container images. 3. Runtime: The Runtime provides the environment in which the application runs. It consists of the Container Engines where the application runs along with the associated storage & networking. containerd & rkt are the most widely used Container engines. Flannel, OpenContrail provide the necessary overlay networking for containers to interact with each other and the outside world while Datera, Portworx, AppOrbit etc. provide the necessary persistent storage enabling easy movement of containers across clouds. 4. Orchestration and Management: Tools like Kubernetes, Docker Swarm and Apache Mesos abstract the management container clusters allowing easy scheduling & orchestration of containers across multiple hosts. etcd, Consul provide service registries for discovery while AVI, Envoy provide proxy, load balancer etc. services. 5. Application Definition & Development: We can build micro-services for applications across multiple langauges — Python, Spring/Java, Ruby, Node. Packer, Habitat & Bitnami provide image management for the application to run across all infrastructure — container or otherwise. Jenkins, TravisCI, CircleCI and other build automation servers provide the capability to setup continuous integration and delivery pipelines. 6. Monitoring, Logging & Auditing: One of the key features of managing Cloud Native Infrastructure is the ability to monitor & audit the applications & underlying infrastructure. All modern monitoring platforms like Datadog, Newrelic, AppDynamic support monitoring of containers & microservices. Splunk, Elasticsearch & fluentd help in log aggregration while Open Tracing and Zipkin help in debugging applications. 7. Culture: Adopting cloud native practices needs a cultural change where teams no longer work in independent silos. End-to-end automation of software delivery pipelines is only possible when there is an increased collaboration between development and IT operations team with a shared responbility. 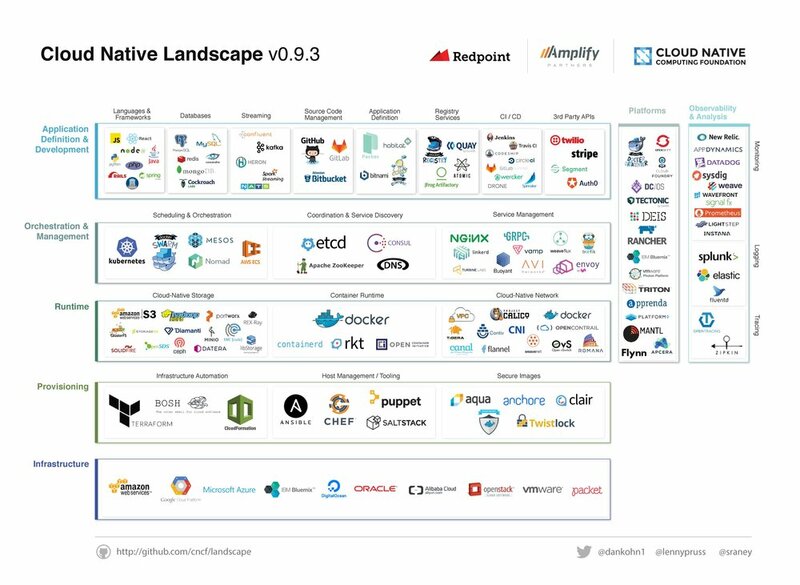 When we put all the pieces together we get the complete Cloud Native Landscape as shown below. I hope this post gives an idea why Cloud Native is important and what the main benefits are. As you may have noticed in the above infographic there are several projects, tools & companies trying to solve similar problems. The next questions in mind most likely will be How do i get started? Which tools are right for me? and so on. I will cover these topics and more in my following blog posts. Stay tuned! Please let us know what you think by adding comments to this blog or reaching out to chirag_jog or velotio on Twitter. Learn more about what we do at Velotio here and how Velotio can get you started on your cloud native journey here. Newer PostBots: Disruption or Bubble?